Think your dog deserves to be in the doghouse? You should see what other puppy parents have to deal with—stealing, running away, poor hygiene habits, and inappropriate and inconsiderate behavior. 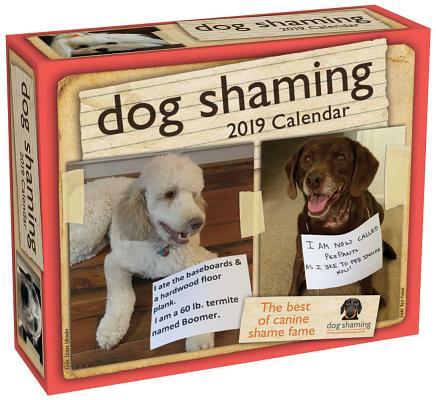 The Dog Shaming 2019 Day-to-Day Calendar features photos of some of the funniest cute-but-criminal canines submitted to the popular blog. Each full-color page of this calendar shows a contributed photo of the guilty pup with a sign describing his transgression. Everyone who has shared life with a dog can relate to the crazy antics and appreciate the adorable expressions that make it hard to stay mad at our furry friends for long.